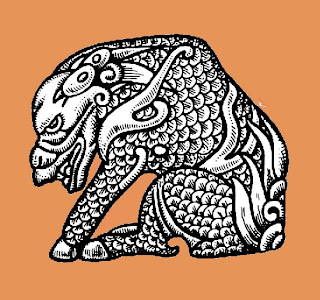 In a recent ShukerNature blog post (click here), I discussed the celestial stag – just one of several obscure monsters and entities from Chinese folklore that were documented in Jorge Luis Borges's classic work, The Book of Imaginary Beings (rev. ed. 1974). "The Hua-fish, or flying snakefish, appears to be a fish but has the wings of a bird. Its appearance forebodes a period of drought." Elsewhere I have also seen it said that this creature's appearance presages an outbreak of pestilence. In short, therefore, it is not something that one wishes to see if all is going well! 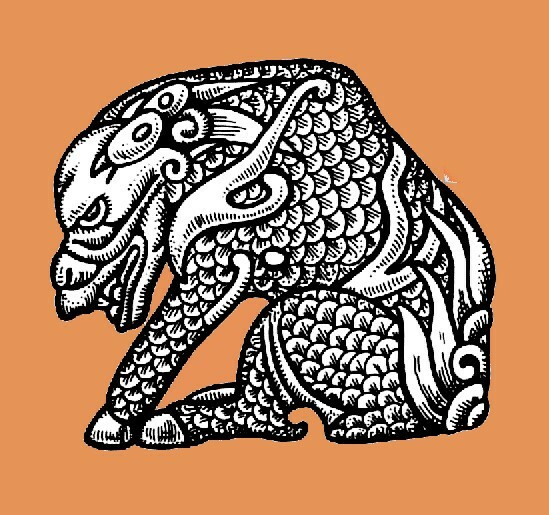 The hua fish is just one of several curious beasts of fable that were included in the T'ai P'ing Kuang Chi ('Extended Accounts of the Reign of Great Tranquillity and Prosperity'), which was completed in 978 AD, and published three years later. So obscure is this legendary animal that I know of only one excellent portrayal of it – the spectacular illustration that opens this present ShukerNature blog. Within my library are quite a few delightful works of what I refer to as pseudozoology. Most of these are large, lavishly-illustrated books purporting to be republished tomes of arcane natural history, but which upon reading are swiftly recognised as adroitly-constructed fiction penned with tongue very firmly in cheek. 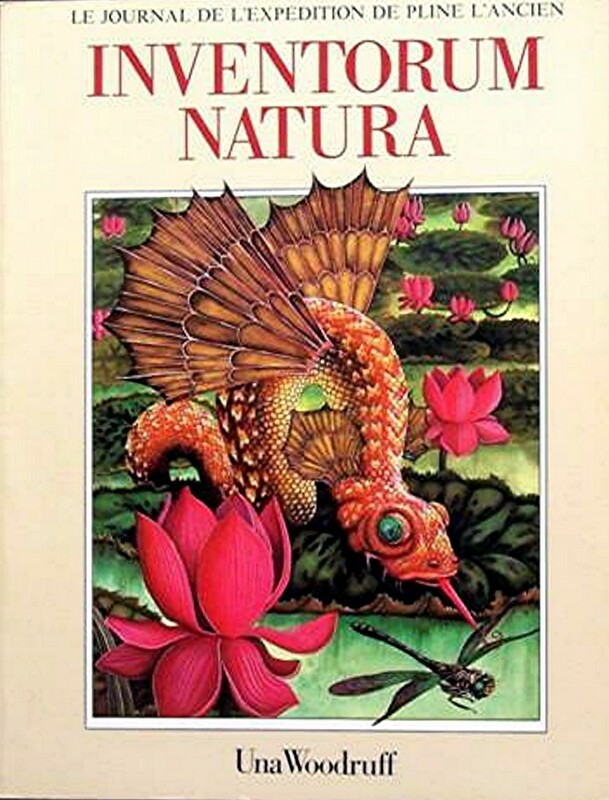 An excellent example of this highly-specialised genre is a truly spectacular tome entitled Inventorum Natura: The Expedition Journal of Pliny the Elder (1979), compiled and exquisitely illustrated by celebrated fantasy writer-artist Una Woodruff – and this is the work from which the above illustration of the Chinese hua fish is derived. Moreover, as seen below, it also features on this book's front cover. Although Woodruff's book is spoof fiction, the mythological creatures documented in it are all genuine creatures of legend as opposed to invented ones. Consequently, if anyone has additional details concerning the hua fish, I'd greatly welcome seeing them submitted here as comments. LEGLESS IN NEPAL - A LIMBLESS HIMALAYAN CROCODILE DRAGON? 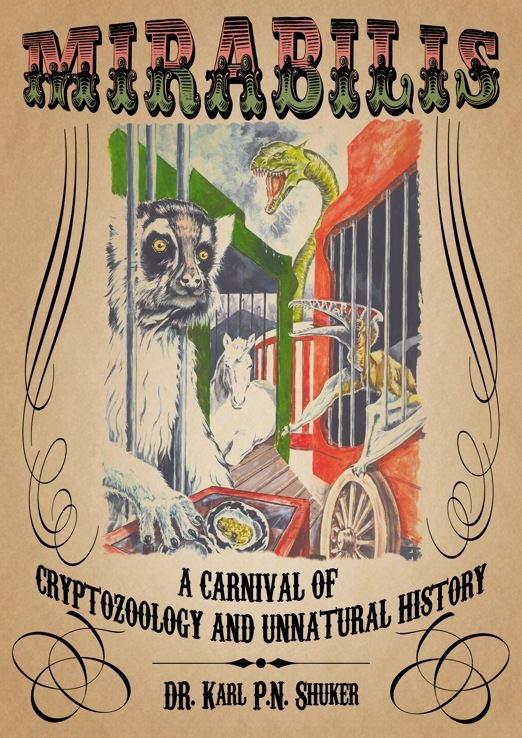 As comprehensively documented in my latest book, Mirabilis: A Carnival of Cryptozoology and Unnatural History (2013), crocodilian mystery beasts come in all shapes and sizes and are of worldwide distribution. Yet few, surely, can be stranger than the giant limbless version reported from southern Asia as recently as 1980. That was when Reverend Resham Poudal, an Indian missionary, was leading an entourage through a Himalayan jungle valley in Nepal. They came upon what seemed at first sight to be an enormous log, greenish-brown in colour, lying on the ground across their planned path – and then the 'log' moved! To the great alarm of everyone present, it proved to be a huge limbless reptile, whose scaly serpentine form blended in so well with the surrounding vegetation that when stationary, it did indeed look exactly like a log or fallen tree trunk. 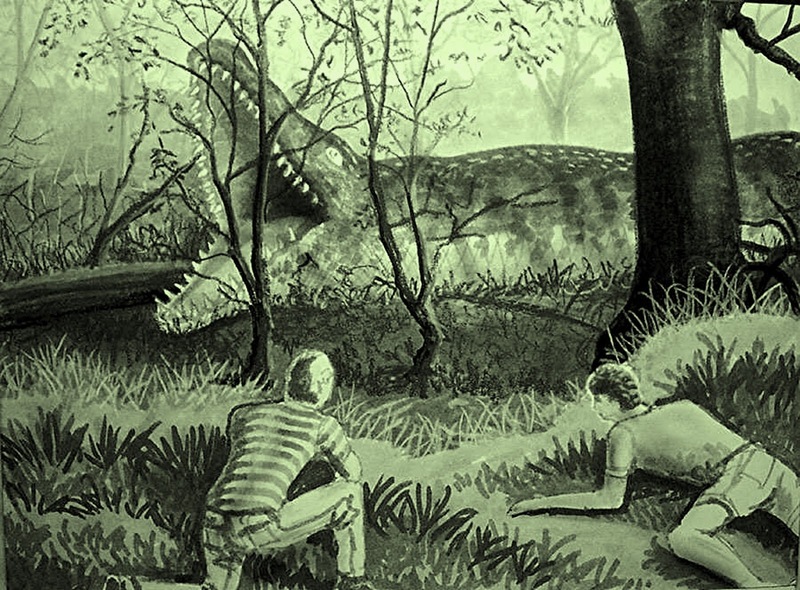 Its eyewitnesses estimated the creature's total body length to be at least 42 ft, and approximately 6.5 ft in circumference, but most shocking of all were its jaws. For whereas those of true snakes, even massive ones, are relatively short in relation to their body, this mystery reptile's were extremely long, greatly resembling a crocodile's jaws. And although they were motionless, they were fully open, yielding a gape wide enough for a 6.5-ft-tall human to stand inside! 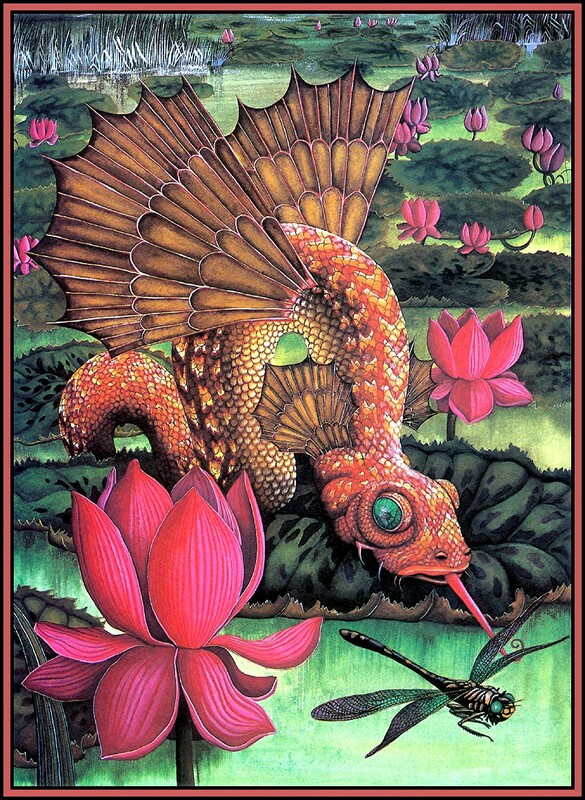 As I learnt from veteran cryptozoological explorer Bill Gibbons, who has also written about this bizarre cryptid, the entourage's native Nepalese members informed the Reverend that they considered these 'crocodile-snakes' to be dragons, but stated that they were only very occasionally encountered - and even when one was met with, it rarely moved. Instead, it would simply lie impassively with its monstrous jaws agape and wait for unsuspecting prey, usually water buffaloes, to approach, not seeing its enormous yet perfectly camouflaged form until it was too late. 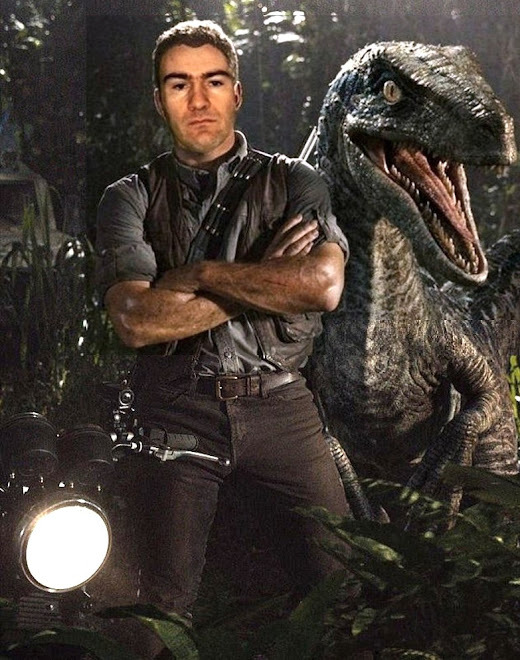 For as soon as a buffalo walked within range, the dragon's open jaws would seize it, and from those immensely powerful killing implements, brimming with sharp teeth, there would be no escape. In addition, the natives claimed that its eyes glowed like luminescent lamps at night (a feature also reported for anacondas and other very large snakes), which helped to lure prey. But if such a remarkable creature as this truly exists, what could it be? Possibly an immense species of snake with unusually large jaws, or perhaps a gigantic legless lizard? Might it even be a unique limbless species of terrestrial crocodilian, highly specialised for this cryptic, motionless lifestyle? Whatever it is, it certainly does not match the appearance of any reptile currently known to science. 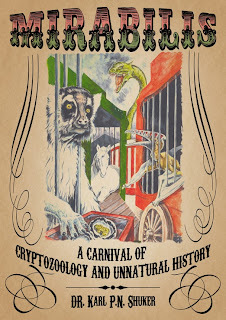 This ShukerNature blog post is excerpted from my newly-published book Mirabilis:A Carnival of Cryptozoology and Unnatural History (Anomalist Books: New York, 2013), which is available as a hard-copy paperback book and also as a Kindle e-book. 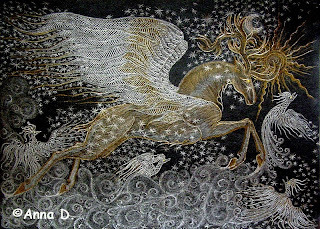 While browsing online recently, I came upon a fantasy painting entitled 'Stag of Heaven' that was so exquisite it inspired me to write a short poem featuring the divine creature depicted (click here to read my poem and view the painting in question on my Starsteeds poetry blog). The painting's title also recalled to my mind the real celestial stag – if we can truly apply the word 'real' to anything that is entirely folkloric in nature. However, this latter entity is a very different animal indeed – a decidedly macabre one, in fact. "We know absolutely nothing about the appearance of the Celestial Stag (maybe because nobody has ever had a good look at one), but we do know that these tragic animals live underground in mines and desire nothing more than to reach the light of day. They have the power of speech and implore miners to help them to the surface. At first, a Celestial Stag attempts to bribe the workmen with the promise of revealing hidden veins of silver and gold; when this gambit fails, the beast becomes troublesome and the miners are forced to overpower it and wall it up in one of the mine galleries, It is also rumoured that miners outnumbered by the Stags have been tortured to death. "Legend has it that if the Celestial Stag finds its way into the open air, it becomes a foul-smelling liquid that can breed death and pestilence." Yet despite its apparent anonymity, the celestial stag has been depicted by several artists and sculptors, with the illustration opening this present ShukerNature blog post being perhaps the best known example. Another popular depiction of this creature is as a black stag with blank eyes. However, writing about it in his book Chinese Ghouls and Goblins (1926), which was the original source of Borges's above-quoted information, British author Gerald Willoughby-Meade (who in turn derived his data on it from 18th-Century Chinese scholar Yuan Mei's tome Tsu Pu Yuh) suggested that perhaps 'celestial stag' was a mistranslation of its original Chinese name - because in traditional Chinese folklore it does not appear to share any affinity with any kind of deer, and is of subterranean not celestial abode. "Celestial roes are not men, but belong to the class of kiang si or corpse-demons…Yunnan province has many mines from which five kinds of metal are extracted. If they collapse, preventing the miners from getting out, then, if these men are fed for ten years or even for a hundred by the breath of the earth and of those metals, their bodies do not decay. Though they are not dead, their material substance is dead. "It being underground perpetual night for those who work those mines, these men mostly carry a lamp on their forehead. When, while working their way into the ground, they fall in with a celestial roe, this is entranced with joy. Complaining of cold, it asks them for some tobacco, which it smokes immediately; then it prostrates itself upon the ground, entreating the men to take it out of the mine. In reply the miners say: 'We have come here for gold and silver, and we have not yet discovered any veins from which to procure some; do you know where the gold grows?' And the celestial stag guides them to a mine where they can reap a rich harvest. But on leaving the mine, they delude the spectre, saying: 'We must get out first, and then we shall take you out of the shaft with the lift'. And by the rope fastened to the bamboo lift they haul the creature up, but halfway they cut the rope, letting it fall down and die. "It has occurred that the men in charge of the mine-sheds were more benevolent and compassionate, and hauled up some seven or eight of those beings. But as soon as these felt the wind, their clothes, flesh and bones changed into a liquid giving out a rancid, putrid stench, which smote with contagious disease all those whose olfactory nerves it affected, so that they died. "This is the reason why, ever since, those who haul up celestial stags cut the rope, lest they have to endure again that stench and lose their lives. Should they refuse to haul them up, they risk being molested by them incessantly. It is also said, that when a small number of celestial stags are overpowered by a great number of men, tied, placed against an earthen wall, and immured firmly on the four sides with walls of clay, a sort of terrace with a lamp being built overhead, they will do no further harm. But if men are outnumbered by stags, they are tormented to death by these, and not allowed to escape." This account readily recalls stories from Western folklore of knuckers, kobolds, and other underground entities of generally malign or at least mischievous nature – far removed indeed from visions of heavenly harts or other deer of divine demeanour! Black lions and black pumas (aka cougars, mountain lions) are two of the three most controversial melanistic mystery cats. In previous ShukerNature articles, I have blogged about whether there is evidence for bona fide black lions and I have exposed as photoshopped fakes no fewer than four popular online photographs of supposed black lions (click here and here). I have also documented a partially black captive lion (click here), and blogged extensively about alleged black pumas (click here). Now, to complete this trio of ebony enigmas of the feline kind, here is my investigation of its third member – the black tiger. By this, I am referring to tiger specimens whose coats exhibit an abnormally dark background colouration, thereby rendering their stripes cryptic, visible only when viewed at close range in certain lights or at certain angles. 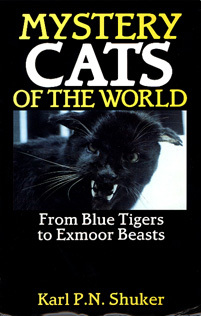 In my very first book, Mystery Cats of the World (1989), I presented the most comprehensive coverage of black tigers ever published. Regrettably, however, this has since been plagiarised shamelessly on numerous occasions and on many websites, often without including any reference or credit to my own research. 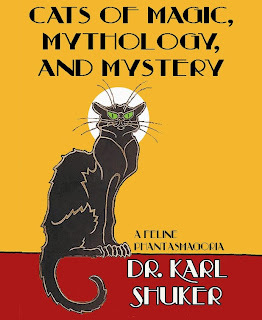 Consequently, I felt that it was high time that my book's original black tiger coverage was presented online, so here it is, quoted in full (except for its text's superscripted bibliographical references) from Mystery Cats of the World. 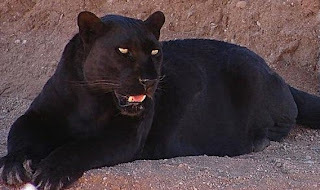 Melanism in felids is most frequently exhibited by tropical species, as exemplified by the leopard and jaguar. Consequently, one would expect the tiger to exhibit an all-black morph too. Yet, very surprisingly, not a single specimen of a melanistic tiger has ever been submitted for official scientific examination. Indeed, in recent books dealing with felids, mention of black tigers is either omitted or limited to a couple of lines in which alleged sightings of such cats are generally discounted as panther misidentifications. Supported as it is, however, by a very extensive history of observations and reports, the subject of black tigers is one which should not be dismissed so lightly. "I have also the opportunity of adding the portrait of an extraordinary Tyger, shot a few months ago by the Nairs in this neighbourhood, and presented to the Chief as a great curiosity. It was entirely black yet striped in the manner of the Royal-Tyger with shades of a still darker hue, like the richest black, glossed with purple. My pencil is very deficient in displaying these mingled tints; nor do I know how to describe them better than by the difference you would observe in a black cloth variegated with shades of a rich velvet." The current whereabouts of this painting is unknown; in October 1987 I learnt from Oscott College's rector, the Rt. Rev. Mgr. Michael J. Kirkham, that in 1965 the entire Forbes collection was sold at Sotheby's, and no record appears to have been kept of the black tiger painting's new owner. A follow-up letter concerning black tigers, written by Lieutenant-Colonel N.M. Hughes-Hallett, appeared in Country Life three weeks after Stonor's article and referred to a book entitled Sophie in London, 1786, published in 1933. In this, the lady in question recorded her impressions of a trip to the Tower of London's menagerie, mentioning lions, leopards, tigers and wolves, and also noting: "The all-black Tiger, which Mr Hastings brought with him from the East Indies is most handsome, but his tigery glance is horrible." 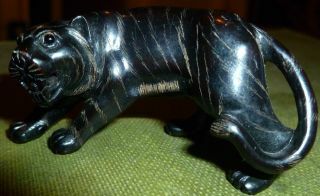 Another eighteenth-century black tiger? The next report which I have is a short item from The Observer for 27 January 1844, which records that a black tiger (originally intended as a present from the King of Java to Napoleon) was currently on display at Kendrick's collection of exotic animals opposite St James's Church, Piccadilly. "It was a full-sized tiger, and the skin was black, or very dark-brown, so that the stripes showed rather a darker black in the sunlight, just as the spots are visible on the skin of a black leopard ... by the time that we arrived the carcase was swollen, the flies were buzzing about it, and decomposition had set in so that those of our party who knew best, decided that the skin could not be saved.... Captain Swatman, who was in charge of the Government elephant kheddas, and Captain Hore (afterwards Lord Ruthven), of the 25th N.I., were well-known sportsmen, and had each of them killed many tigers. No doubt was expressed about the animal being a black tiger." Moving into the twentieth century, T.A. Hauxwell (then the Conservator of Forests at Maymyo, Burma) recorded in 1914 the wounding of a supposed black tiger at a range of 15 yards/13.5 m by his son, in the Bhamo district. At first his son took the all-black creature to be a pig, while his shikari insisted that it was a bear. Upon approaching very cautiously the area in which the growling wounded beast was moving, however, they observed enormous round pug-marks, measuring 20 in/50 cm in circumference, which in their judgement seemed closely similar to those of a tiger. Sadly, the body of this mysterious animal was never recovered. In 1928 the editors of The Field noted that a dead black tiger had been reported in the Lushai Hills, south of Assam; frustratingly, this specimen's skin was too decomposed to be saved. During the early 1930s, a reward was offered for the destruction of a savage creature inhabiting India's Imphal Manipur state. When eventually dispatched, the latter proved to be an adult black bear - but the Mikirs insisted that it was a black tiger. In the opinion of J.C. Higgins, however, this peculiar classification was largely influenced by the fact that the reward to be gained if the creature proved to be a tiger was more than twice that on offer for a bear. Also during the 1930s, a series of letters concerning black tigers appeared in The Times. The earlier items dealt with cases noted above, but the later letters provided several additional examples. Captain Guy Dollman of the British Museum (Natural History) reported that a young black tiger had been shot in the Central Provinces some years earlier and had possessed a dark brown background coat colour, overlaid by black stripes. He also commented that a magnificent black tiger had been shot in 1915 by some natives in Assam, east of Dibrugarh - of especial interest was the fact that this specimen was completely black, no vestige of striping being visible even in sunlight. Colonel S. Capper placed on record a very clear sighting of a black tiger made through a deer-stalker's telescope by himself and his hunting companion C.J. Maltby on 11 September 1895, on the Cardoman Hills of southern India. The tiger was initially lying on a rock at the jungle's edge, but eventually it rose and disappeared from sight into the latter. Upon arrival at this spot, Capper and Maltby discovered the clear pug-marks of a tiger - both men were well acquainted with tiger and leopard spoor. The first few lines of a letter to The Times in January 1937 by R.G. Griffiths contained the news which science had been awaiting so long - a black tiger had been captured alive! A colossal creature, 12 ft/360 cm long, it had been caught on 4 September 1936 in the vicinity of Dibrugarh. So far so good. As one might have expected of a mystery felid, however, the truth - as Griffiths revealed in the lines that followed - was rather different. Further enquiries (made by Dr Baini Prashad, director of the Zoological Survey of India at Calcutta's Indian Museum) not only revealed that it was a lot shorter than claimed but also discovered that it was not a tiger at all. 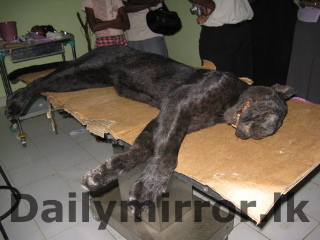 Instead, it was nothing more than an 8 ft/240 cm-long black panther. 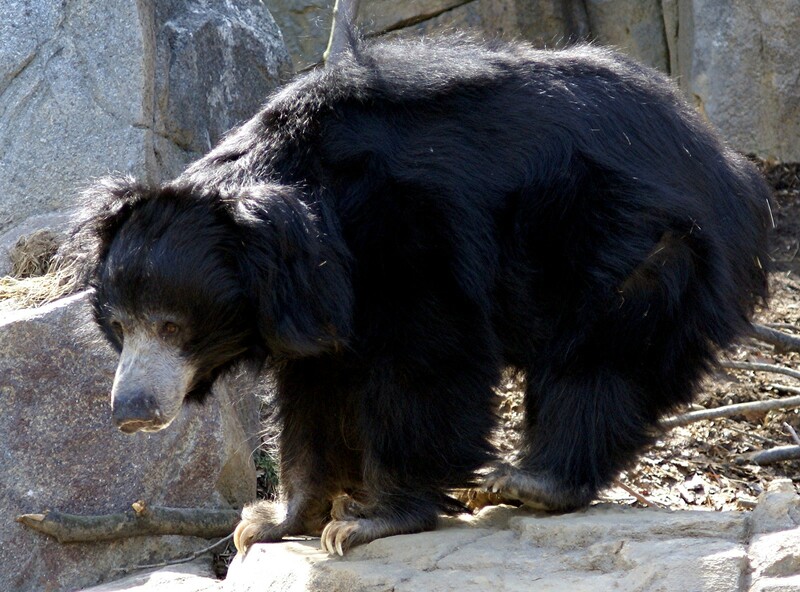 This muddled melanistic mammal was later sold and transferred to Calcutta, where Griffiths had recently seen it; further details were given by Captain Dollman. Regrettably, it seems as if the misidentified panther of Dibrugarh sounded the death-knell for the bona fide black tigers; until then, the existence of such cats had never been seriously doubted, but following this sorry episode the black tiger appeared to fall out of fashion. In a letter published by The Field on 9 January 1937, Dunbar Brander recorded that a couple of years earlier the sportsman and Calcutta barrister J.A. Clough had seen, in the deputy commissioner's bungalow at Betul, Central Provinces, a tiger skin whose background colour was chocolate brown. When questioned concerning this, the deputy commissioner mentioned that a second tiger of this type had been sighted in the area where his own specimen had been killed. By and large, however, reports dried up, and the black tiger became yet another felid of fiction and fable rather than fact. To complete this account, I will come full circle, back to the 1964 Country Life article by Charles Stonor. In this, Stonor also included a personally collected report of particular interest. He recalled that, whilst in the Mishmi Hills, at the foot of the Assam Himalayas, he had learnt from a local headman that the Mishmi tribespeople knew of an occasionally seen creature referred to as the 'bear tiger', which resembles a normal tiger in all respects but one - it is completely black. 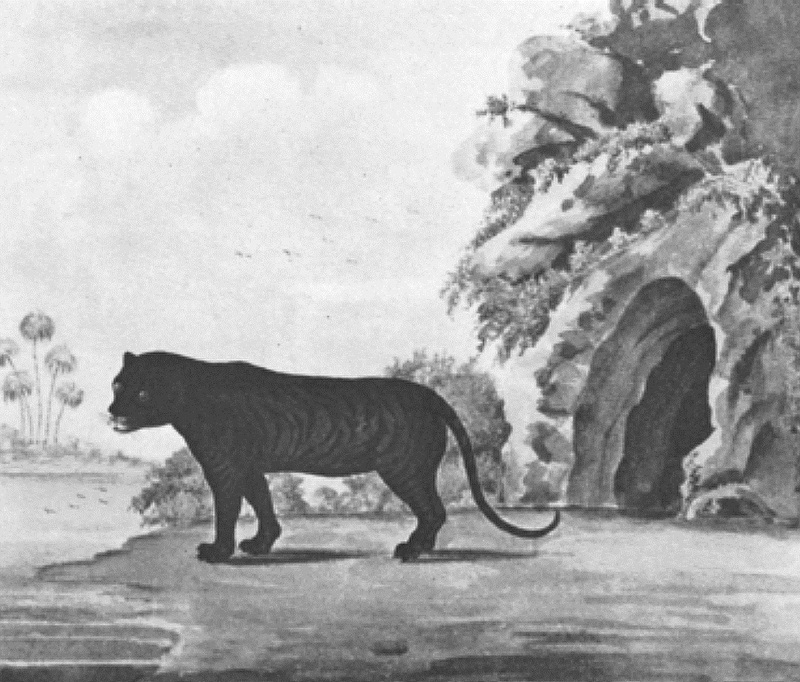 At Stonor's suggestion that it could simply be a panther, the headman reasserted vehemently that it was a black tiger - stating that not only was it of full tiger stature but also, when observed in sunlight, one could discern the familiar tiger pattern of stripes upon its otherwise inky coat. Very recently, I was informed by [correspondent] Phil Bennett that in India, during 1952, the people of one village complained that an exceedingly large black tiger was killing their cattle. According to these villagers, the cat in question was between 20-24 ft/600-720 cm in length! Although the authorities searched for this extraordinary beast in vain, some unusually large pug-marks were found, which could not be explained. Further reports of this animal continued to emerge until 1967 (Bennett, pers. comm.). With the exception of this latter colossus (whose length is clearly an immense exaggeration on the part of the locals, its size presumably increasing in direct proportion to their fear of it), the alleged black tigers which figure in the above collection of reports conform to a standard appearance. The only degree of variation on record concerns the pelage's background colour - dark brown in some individuals, totally black in others - but such variation is commonly seen amongst melanistic individuals of other species too, including the leopard. 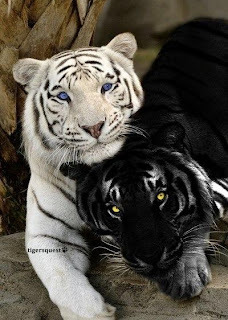 Is it possible, therefore, that genuine melanistic tigers do occur? Let us first consider some other phenomena which could explain alleged black tiger sightings. For example, could they be, as with the captured Dibrugarh specimen from 1936, nothing more than misidentified panthers? This could certainly be the case with sightings involving only the briefest of observations, or made in conditions of poor lighting or deceptive shade, or made by observers with little or no experience of tigers. Conversely, most of the reports mentioned in this section have taken place in good light, with ample observation time (in some cases the specimen was dead, and hence unlikely to run away! ), and sometimes involving eyewitnesses with superb credentials. These latter include: experienced tiger-hunters Captain Swatman and Lord Ruthven, naturalist and Fellow of the Zoological Society of London C.T. Buckland, and painter and Fellow of the Royal Society James Forbes. The two reports incorporating these eyewitnesses' accounts are in themselves enough to verify that black tigers as well as black leopards exist. The experience of various eyewitnesses in distinguishing readily between tiger and leopard spoor also supports the validity of tiger identifications in relation to certain other black tiger reports. In addition, the description of black tigers contained in the reports given here - a tiger-sized black (occasionally dark brown) cat whose stripes can be discerned in sunlight - is exactly that which we would expect for a true melanistic (non-agouti) tiger. Certainly it is inconceivable that anyone could fail to distinguish (at least on a dead specimen) between the cryptic spots of a panther and the long, continuous shadowy stripes of a melanistic tiger. This being the case, how did the infamous Dibrugarh 'black tiger' fiasco come about? Most probably not through any morphological muddle or misconception but through an error of etymology, for, as E.P. Gee points out, bagh - the word for 'tiger' in various parts of India - is, in fact, commonly used for almost any cat species. In short, the locals will refer in their language to a 'striped tiger' (the true tiger), a 'spotted tiger' (leopard) and so on, right down to the smaller cat species. Consequently, when the Dibrugarh 'tiger' was captured, it would simply have been referred to locally as a 'black tiger', even though it was a black leopard, and even though the locals knew it to be a black leopard. The error came from the loose translation of bagh not being familiar to non-locals, who naturally took 'black tiger' to mean just that. It is also worth noting that in the early nineteenth century British people referred to both tiger and panther as 'tiger', with the epithet 'royal' being added when speaking of the genuine striped tiger. Thus the Piccadilly 'black tiger' was probably a black panther - this may also have been the identity of the specimen noted in Sophie in London, 1786. 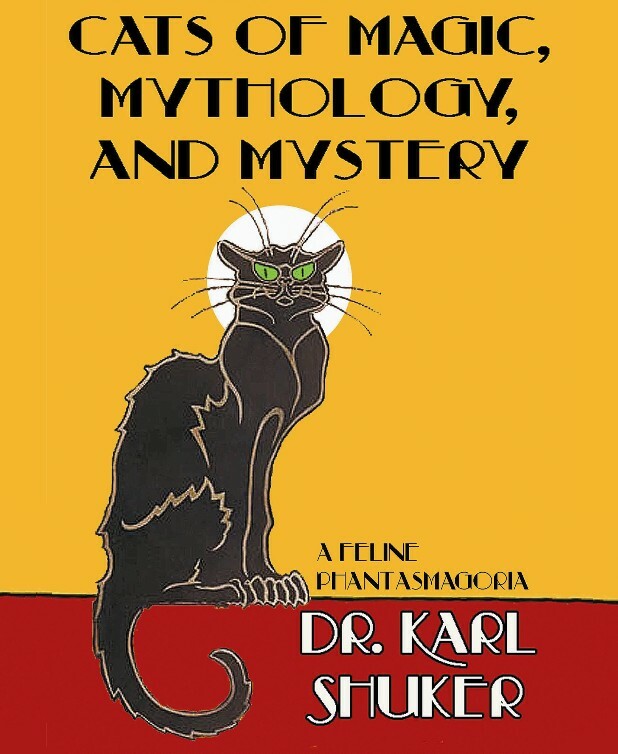 Excluding etymological ambiguities, however, it is evident that few of the black tiger reports documented here could have been based upon panther sightings. Another explanation sometimes put forward to deny the existence of genuine black tigers is that sightings of such were really of normal tigers whose coats had become darkened in various ways by external factors. One such manner involves deceptive shadows cast upon terrestrial beasts in dense jungles during early morning and evening. However, such shadows cannot account for the skins of dead black tigers reported here, which were examined carefully by competent observers. A suggestion by Dunbar Brander is that black tigers are actually normal tigers that have rolled in the charcoal and ashes of forest fires. If this were true, the cryptic stripes so characteristic of the black tigers reported would have been totally hidden by the charcoal. Moreover, observers of the dead specimens would surely have noted the presence of charcoal on such skins - no mention of its presence, however, has ever been made. Dunbar Brander once watched a large tiger devouring a kill and, in so doing, becoming covered with its victim's blood, which rapidly turned from red to black. He commented that, had he not seen this transformation taking place before his very eyes, he would have been firmly convinced that he had stumbled upon a genuine black tiger. Once again, however, such an occurrence would hide the cryptic stripes clearly observed by many black tiger eyewitnesses. This is equally true relative to yet another of Brander's suggestions. In various jungle pools used by tigers for bathing and by tanners for skin-preservation, certain tree barks are introduced to poison fish that become marooned there when the pools shrink during hot weather; these barks also stain fur a deep brown shade and could be responsible, according to Brander, for reports of brown tigers, dead or alive. Elegant, but unsatisfactory. Only one plausible possibility is left - that sightings of alleged black tigers have really involved melanistic tigers after all, and why not? As vouched for by felid geneticist Roy Robinson, the descriptions of cryptic stripes provide the most telling piece of eyewitness evidence in favour of such creatures' existence. What remains to be explained is why they should be so rare, in contrast to the relative abundance of the melanistic morph in leopards and other tropical felids. The answer is probably connected to the fact that, whilst such species have normally originated in the tropics, the tiger evolved in a much colder climate, invading Asia's tropical zones only in relatively recent times (geologically speaking). Black is the most efficient heat radiator, hence black coat colouration is advantageous to a felid inhabiting a tropical locality, for it would assist it effectively to release heat from its body, especially in shade, where dark colours operate most efficiently. Consequently, melanistic coat colouration would be selected as a result of this inherent survival advantage, and thus the frequency of the non-agouti mutant allele would increase within populations of leopards etc. Once the tiger also entered such locations, this same allele would then begin to increase through selection in tiger populations. Yet because this allele would have been exposed to positive selection for far less time than in populations of leopard etc (due to the tiger's much more recent settlement in the tropics), its frequency (and hence its expression in the form of black tigers) would not be as great as in longstanding tropical felids - and therefore far fewer black tigers would be born. Moreover, due to the extremely severe depletion of the normal tiger in recent times (a proportion of which must be heterozygous for the mutant non-agouti allele to explain the origin of black tigers in the first place), the numbers of black tigers being born would again be reduced. Finally, it is worth noting that most black tiger reports derive from localities in fairly close proximity to one another and to the north-east of the Bay of Bengal - such restricted distribution (unusual for a simple mutant) presumably marks its origin (cf. the king cheetah, white lion, blue tiger). 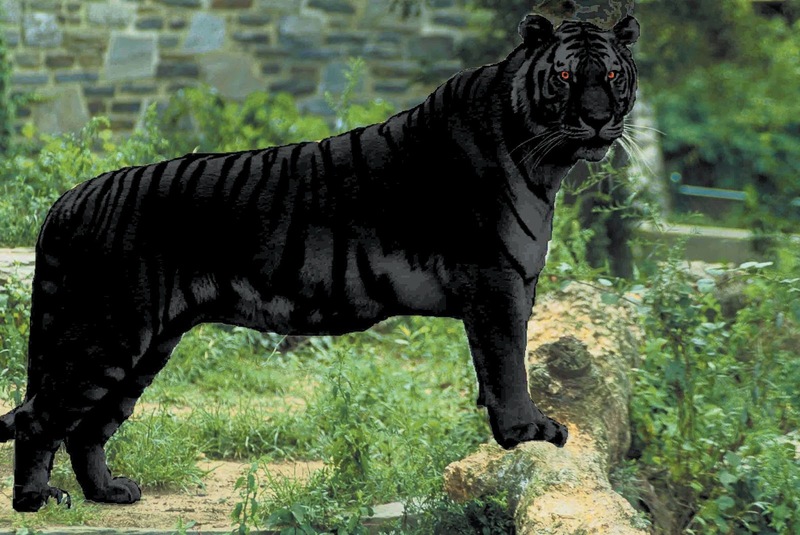 In short, everything points to reports of black tigers being based upon melanistic specimens. Ironically, the black tiger nowadays could in fact be a felid of fable after all, for this fascinating mutant form may have slipped quietly and tragically into extinction while science has been casually contemplating whether or not it ever existed in the first place. "It had a normal ground color, but considerable darkening over the shoulders, down both front legs, over the pelvis, and encompassing both back legs. The darkening was essentially the same coloring as the stripes. Over the areas of darkening, the stripes were only partly visible." This was clearly a case of melanism, albeit of an incomplete nature - which makes it all the more tragic that shortly after their birth, three of the four cubs, including this unique black one, were killed by their mother. 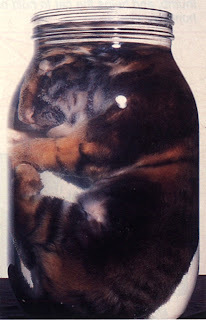 Fortunately, Dr Thomas preserved the black cub in formalin, and although this has faded its colouration somewhat over the years, photos taken of it not long after its preservation reveal its remarkable appearance. Of course, it is conceivable that, had it survived to adulthood, this dark-furred tiger may have become lighter. On 6 March 2009, the carcase of what was claimed to be a female black tiger was found in a poacher's snare in Deniyaya, southern Sri Lanka. 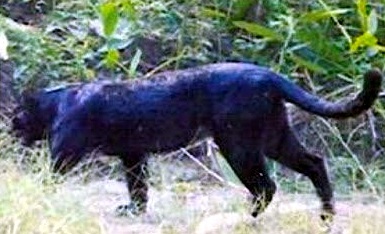 However, when viewed at close range, it was found to possess spots, not stripes, and as can be seen here, a photograph of this specimen readily confirms that it was a black panther, not a tiger. The confusion arose from the Sinhalese term 'kotiya' being used for both leopard and tiger by some villagers. Moreover, the tiger is not native to Sri Lanka anyway. There have also been claims of black tigers having been exhibited in circuses, which I have again investigated (click here), but no confirmation of such claims has so far been uncovered. 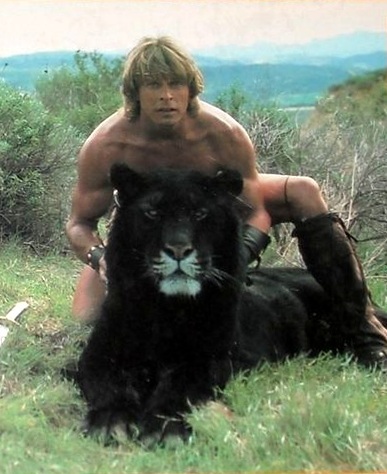 And the apparent black tiger that featured in the 1982 action movie 'The Beastmaster' starring Marc Singer was nothing more than a normal tiger whose coat had been dyed black. I hope you will forgive my impromptu email; I was idly browsing your blog when I came across the post concerning black tigers [my article re putative black tigers in circuses - click here to read it]. You commented that ‘the fact that its stripes could still be discerned against its fur's black background colouration is precisely what one would expect with a genuine melanistic tiger’. It put me in mind of the following entry from the Erya (爾雅), an ancient Chinese encyclopaedia written c. 300 BC, in which one of the commentaries specifically mentions this fact. As this work has not, to my knowledge, been translated into English, and Classical Chinese is a somewhat inaccessible language, I thought the following excerpt might be of some small interest. Note that here is a specific (albeit very obscure) character meaning ‘black tiger’ (虪 shu), rather than simply the characters for ‘black’ and ‘tiger’ separately, by which the Erya defines it (黑虎). But looking in the Kangxi dictionary, I find yet another ‘black tiger’ character following it, this one so long-forgotten that it isn’t even in Unicode. http://www.kangxizidian.com/kangxi/1076.gif (18th from the right). Of course, ancient Chinese literature is awash with mythological beasts, but I thought the particular observation of stripes in this instance lends credence to a real animal. And that there are at least two discrete words for a black tiger (the second one would be pronounced teng), suggests that they were well acquainted with melanistic tigers even further back than the Warring States period. Could this Chinese mystery cat, the shu, be a genuine black tiger? My principal concern is that it is said to be small, whereas melanistic cats across a wide spectrum of species generally tend to be larger than normal. 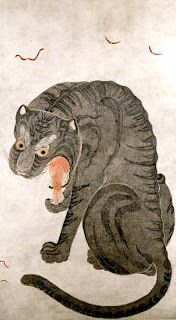 Nevertheless, it is a remarkable document, suggesting strongly that some form of all-black felid did exist in ancient China, though even if so it must surely be long extinct now, as no modern-day reports of such a beast are in evidence. So far, the alleged black tigers that I have been chronicling here have apparently been of the melanistic variety. However, black tigers of the pseudo-melanistic variety are also on record, and the existence of this latter form has actually been formally confirmed, by the procurement and preservation of skins. Sometimes reported from Sunderbans are tigers whose coats exhibit an abnormally dark background colour patterned with orange stripes, i.e. 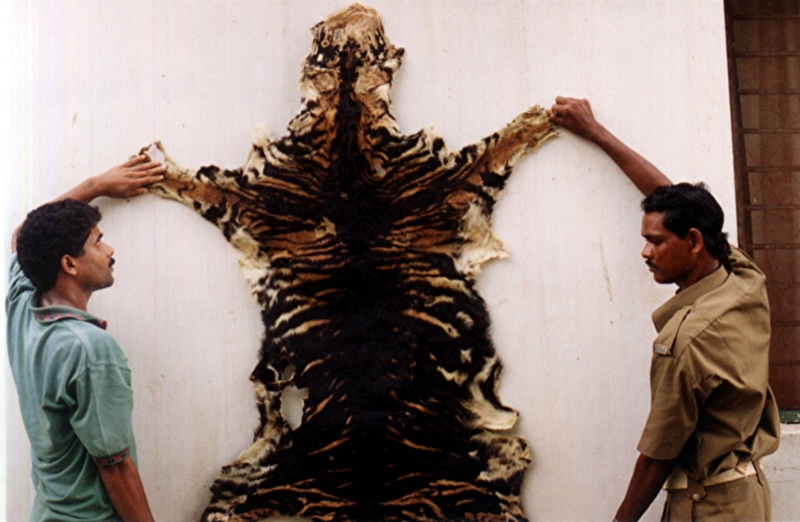 the reverse of the normal tiger pelage, which suggests that they may be pseudo-melanistic tigers. In 1993, moreover, news – and photos – emerged of two such tigers killed that year. One was a young tigress killed in July 1993 by a tribal boy in self-defence at the village of Podagad within the Bhandan river valley, in the west of the Similipal Tiger Reserve. The pelt of the other one had been confiscated from a New Delhi hunter-smuggler and was acquired on 20 February 1993 by India's National Museum of Natural History on the orders of a Delhi court. Remarkably, as I learnt from Dr Lala A.K. Singh, and as shown by both skins, it was as if the normal tiger coat colour and patterning had been reversed – for instead of exhibiting an orange background colour and black stripes, both of these tigers sported a black background colour and orange stripes. Looking at them more closely, however, it became evident that the black colour was actually caused by an abnormal widening and coalescing of the normal black tigerine stripes, yielding a solid black mass of colour; and that the orange stripes were not true tiger stripes at all but were actually gaps in the black mass of amalgamated striping through which the tigers’ normal orange background coat colour was still present. This ‘reverse melanism’ is clearly another example of pseudo-melanism featuring nigrism. Moreover, as kindly brought to my attention recently by Australian cryptozoological artist Tim Morris, there is currently a short but fascinating video on YouTube (at: http://www.youtube.com/watch?v=01IX9G7YzGk), uploaded on 5 November 2010 by a user with the screen name uzoouk, which shows a white tiger cub born on 6 June 2010 at the Arignar Anna Zoological Park in Vandalur, Chennai, in India, that is turning black (as also reported on 31 August 2010 by London’s Daily Telegraph newspaper). Although born white like its two siblings and its parents, this remarkable (possibly unique?) little cub has already acquired a coat greatly resembling the pseudo-melanistic condition, and may ultimately transform into a bona fide adult pseudo-melanistic tiger – the first such metamorphosis from a white tiger into a predominantly black one that I have ever encountered. So although there is ample evidence for the reality of pseudo-melanistic tigers, the melanistic tiger continues to elude scientists – or does it? On 12 March 2012, media worldwide carried reports – and a very intriguing colour photograph - concerning what Indian Wildlife officials claimed to be a bona fide melanistic tiger that had lately been observed and photographed in the Similipal National Park's core tiger region. The photo had been snapped by one of the 68 camera traps installed in this particular region of the park by the state government, but no further background information regarding the tiger itself appeared in any accounts that I have so far seen. However, the officials discounted counter-claims that it was merely a black panther. Here is the photo – what do you think that it depicts? Personally, I feel that it looks more leopard-like than tiger-like in overall build and body proportions. It is a great pity that its pelage isn't clearer, to determine whether it bears any cryptic patterning, which would have greatly assisted in identifying it – stripes vs spots, tiger vs leopard. As nothing more seems to have emerged concerning what would be an extremely significant scientific discovery were it truly a melanistic tiger, however, I feel that this too argues against its being the latter, and in favour of its simply being a black panther. But who can say for certain? All that we can say for sure is that the black tiger remains as controversial and tantalising as ever - verily the bête noire of mystery cats!